Copper is an essential trace element required for many vitally important functions in all cell types in most living organisms . Safe copper cellular uptake, its distribution to cuproenzyme formation sites and its excretion are provided by special copper metabolic system. Unidrectional transport of copper atoms to the sites of cuproenzyme formation is provided by proteins of this system consecutively through direct protein-protein interactions. Copper translocation through cell membrane is the crucial stage of copper metabolism. High affinity Cu(I) transporter, belonging to CTR1 family (encoded by SLC31A1), is the main candidate for mammalian transmembrane Cu(I) importer . Despite the current progress in CTR1 structure and function studies many aspects of putative CTR1 mediated mechanisms remain to be unclear. It is still unknown, what protein is the donor of copper for N-terminal domain of CTR1, localized on the cell surface. The copper atoms could be provided by ceruloplasmin (Cp) – a copper-transporting protein, which is the main donor of copper for nonhepatic cells [3, 4]. Intracellular acceptor of copper from CTR1 is either not identified yet. Though it has been shown that there are specific Cu(I)-chaperones (Cox17, Atox, ATP7B) for each cuproenzyme, it is to elucidate if they are able to accept copper from CTR1 intracellular C-terminal domains or not. The investigation of problems mentioned above is very important for the general understanding of copper metabolism. Hex 4.5 docking program was used for protein molecules docking calculations. In Hex' s calculations each molecule is corresponded to 3D parametric functions describing surface shape, electrostatic charge, and potential distributions. So, electrostatic and van-Der-Waals interactions are taken into account in our calculations. By accession of the mutual overlapping score for parametric functions, the expression for docking score is derived as function of the six degrees of freedom in rigid body docking search. With the appropriate scaling factors, this docking score could be interpreted as interaction energy to minimize in the simulation. In our study we used truncated extracellular N-terminal copper-binding motifs of CTR1 as ligands for docking calculation of the interaction with Cp molecule (PDB structure: 1KCW) as well as mono-, di- and trimeric C-terminal copper-binding motifs of CTR1 for docking calculations of the interactions with the reduced 4th metal binding domain of Menkes ATPase (PDB structure: 1AW0). 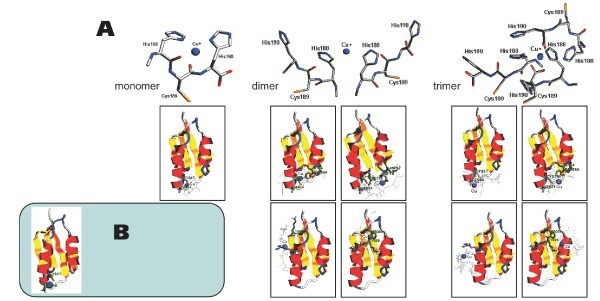 The docking calculations of random oligopeptides with Cp, the reduced 4th Menkes ATPase metal binding domain, as well as of albumin with Cp were carried out as a negative control for docking specificity. Conformations of the used motifs were obtained by geometry optimization using AMBER force field with point charges on atoms obtained in CNDO semi-empirical method using iterative charge calculation. Both methods were used as implemented in HyperChem 7.0 software. The docking rigid-model studies show that all the truncated CTR1 extracellular N-terminal copper binding motifs are strongly favoured to interact with the sites of Cp molecule responsible for binding labile copper. So Cp may possibly serve as the Cu donor for CTR1 N-terminal copper binding sites. The docking of C-terminal copper binding HCH motifs (in monomeric, dimeric or trimeric form) with the 4th metal binding domain of Menkes ATPase revealed conservative CXXC Cu-binding site to be the site of favoured interaction. The results suggest that CTR1 is able to accept Cu from extracellular transporter, Cp, and transfer it further into the cell to Cu binding domain of Menkes ATPase or other Cu(I) chaperones containing CXXC motif. The results agree with in vivo and in vitro experiments supporting the hypothesis, that CTR1 plays the central role in transmembrane copper import. Docking of CTR1 N-terminal copper binding motifs (motif1, motif2 and motif3) and ceruloplasmin molecule (PDB ID: 1KCW). (A) The docking models of the interaction between CTR1 C-terminal copper binding HCH motifs and the reduced 4th Menkes ATPase metal binding domain. (B) The NMR structure of the 4th metal binding domain of Menkes ATPase in metal bound state (PDB ID: 2AW0). The authors are grateful to Professor Ludmila V. Puchkova (Department of Molecular Genetics, Research Institute for Experimental Medicine, St.-Petersburg, Russia) for valuable discussion and kind advice during the study.